Greece has been in the news for all the wrong reasons this year, with the country reeling financially from its debt crisis and fears of default, which even saw banks temporarily close their doors and limit customer withdrawals. Despite these major economic problems, Greece remains a wonderful place to visit and their people are extremely welcoming and thankful to those who visit their beautiful country. I sampled some of Greece’s major attractions in the European summer this year, and must say that I was very impressed not only with its natural beautiful and history but also the positive and happy attitude of the locals. The Greek people are really embracing tourists and are so happy and thankful to those visitors not put off by the economic troubles. They realise that they need tourists and the money they spend in their country more than ever and are making sure they feel extra welcome. While Athens can often get a bad rap from visitors, we had a great time there and the locals were very endearing and highly accommodating. It is not the cheapest place but the history alone makes it well worth a visit, and in our case was matched by the welcoming locals. Mykonos is usually referred to as Greece’s version of Ibiza and while there is plenty happening, we found that it did have a bit more of a family atmosphere. 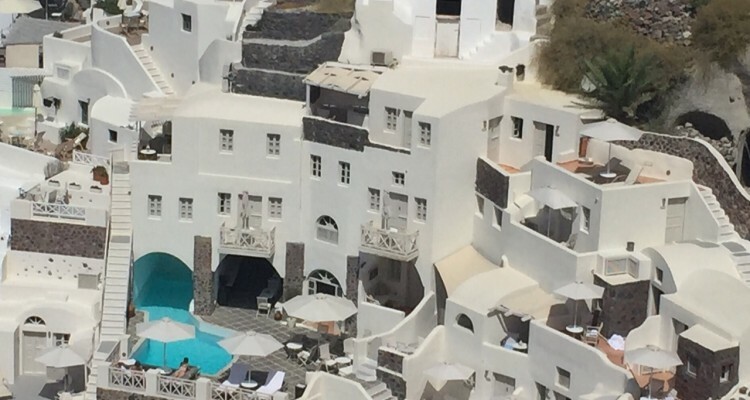 Santorini lives up to everything you have heard about it. It is an amazingly beautiful spot perched high above the soaring cliffs that were created by enormous volcanic eruptions and provide magnificent views over the stunning Greek waterways. Don’t be put off Greece. It is an amazing place to visit and soak up its history, spectacular scenery, food and drink, and to enjoy the warm hospitality of its welcoming locals.